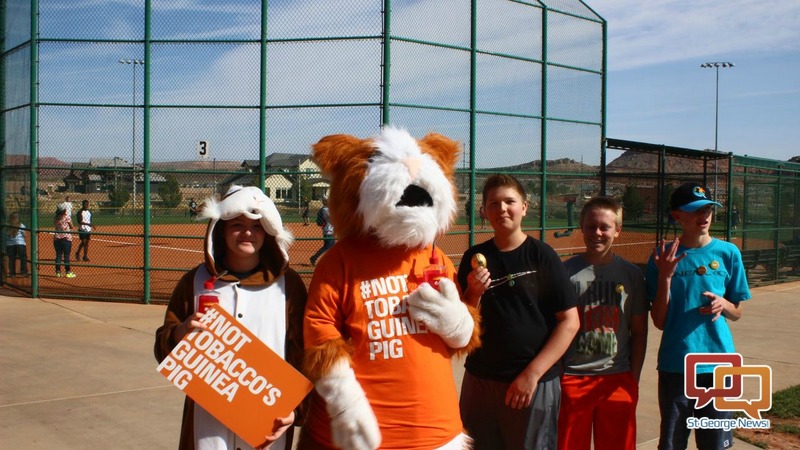 ST. GEORGE — Raising awareness about the dangers of tobacco and nicotine use was the focus of the Washington County Youth Coalition as the group launched its 2nd annual kickball tournament on national “Kick Butts Day” Wednesday. Members of a local group, Island Teens Against Tobacco, were also in attendance at the event. Jacob Horton, a junior at Snow Canyon High School, said helping out with “Kick Butts Day” was important to him because several family members’ lives have been negatively impacted by addictions. “Here at the event we kind of want to just bring a little bit of fun into drug prevention and that’s kind of why I’m here,” said Horton, adding his personal experiences made him want to be a part of the awareness activity. “Where it really starts is your teenage years, that’s the important years, if you get hooked onto it now, you’re going to be hooked onto it for the rest of your life and its’ really hard to kick. Brooklyn Kauvaka, a senior at Pine View High School and a member of Island Teens Against Tobacco, said she was there because she believes tobacco companies specifically target Polynesian teenagers. The event featured informational booths and activities illustrating the dangers of tobacco use. A kickball tournament was the featured event with a dozen 10-person teams participating in addition to the approximately 50 members of the Washington County Youth Coalition. Logan Reid, director of prevention and education at the Southwest Behavioral Health Center, said advisors from his organization and the Southwest Utah Public Health Department oversee the Washington County Youth Coalition in the “Kick Butts” endeavor. Youth and adults alike often aren’t fully aware of the dangers posed by tobacco and nicotine, Reid said. This afternoon I’m here to support the students from Washington County. They attended our national summit on youth activism this past summer in Orlando, Florida, and they had a local project they had to accomplish from attending that summit. This kickball event is their project. They’ve invited youth from around the community to come out and have some fun and learn at the same time. We’re just here to support them in doing that.